Surgery for weight loss. About one hundred and thirteen thousand weight loss surgeries are performed yearly on obese people. These include those who have who have a Body Mass Index of forty or more, and those with a BMI of thirty five or more who have serious health conditions, such as diabetes or sleep apnea. Eighty to ninety percent of these patients undergo the two most common weight loss surgeries – gastric bypass and sleeve gastrectomy. These procedures improve or resolve type two diabetes, hypertension, and elevated cholesterol. However, those who have medical history of a blood clotting disorder, heart attack, stroke, or kidney failure might not be surgery candidates. 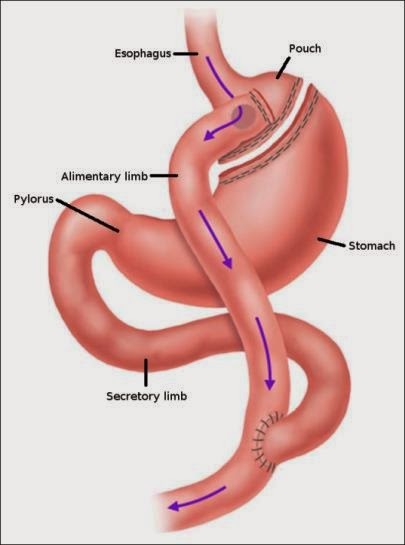 Roux-en-Y gastric bypass surgery is the most common weight loss procedure. It includes eighty percent of all weight reduction surgeries in the U.S.The technique has two parts. The first, devising a small pouch in the stomach. The surgeon divides it into a large and smaller portion. The small part is sewn or stapled to make the pouch. It creates a sensation of fullness during and after a meal. The second part is the bypass. The surgeon disconnects the small stomach pouch from the first part of the small intestine (duodenum). The pouch is connected to a part of the small intestine, the jejunum. This technique is called a "Roux-en-Y." Following surgery, food passes from the stomach into the jejunum, bypassing the duodenum. Calorie and nutrient absorption is decreased. Stomach stapling and Roux-en-Y surgery are performed simultaneously. Together they are called, "Roux-en-Y gastric bypass." Usual inpatient stay following surgery is two to three days.Ten percent of operated patients might have post-operative problems that include wound infection, digestive problems, intestinal ulcers, and rectal bleeding. One to five percent could have complications, such as a blood clot in the lung or heart. The risk is higher for people over age sixty. Weight loss surgery at a center with experienced surgeons reduces risk. Ten percent of operated patients could have diarrhea, cramps, and face flushing after eating. Three to four percent suffer a stomach ulcer or bowel obstruction.Post-surgery weight loss is dramatic. Patients lose up to sixty percent of their pre-operative weight. Related health problems improve or disappear. Permanent lifestyle changes, including several small meals a day, and daily exercise enhance the benefit. Another weight loss technique is lap banding surgery. It is the least invasive and second most common weight loss surgical procedure. It accounts for fifteen to twenty percent of weight reduction techniques. A silicone ring is placed around the upper stomach. The surgeon adjusts the tightness by injecting saline through the skin to fill up the band, or extracting saline to loosen it. If the bands are too tight, they can be loosened. Tightening the bands shrinks the stomach. 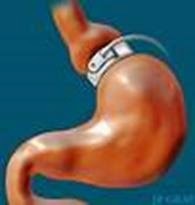 Gastric banding is less likely to cause nutritional problems. It results in less weight loss than bypass surgery. About ninety five percent of operated people say that their quality of life is improved after surgery. Some studies suggest people live longer after weight loss surgery, compared to obese people who don't have surgery.